According to Andean people, Pacha Mama basically means “Personified Mother Earth“ or “Goddess of Life“. 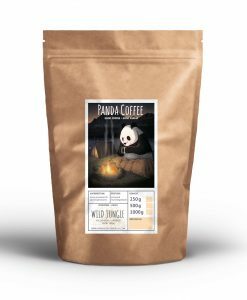 The Panda Coffee Pacha Mama comes from the Peruvian Chanchamayo area Highland and is shade-grown at altitudes of between 1,320m and 1,720m above sea level. This ensures a balanced ripening cycle of our Caturra and Catuai coffee beans. The beans are hand-picked by our coffee farmers between June and July, which is why only mature coffee cherries are cropped. After that, the beans are submerged into a water bath and sun-dried. They are then shipped to the Dresdner Kaffee und Kakao Rösterei, where they are carefully roasted in a drum in order to provide highest quality. 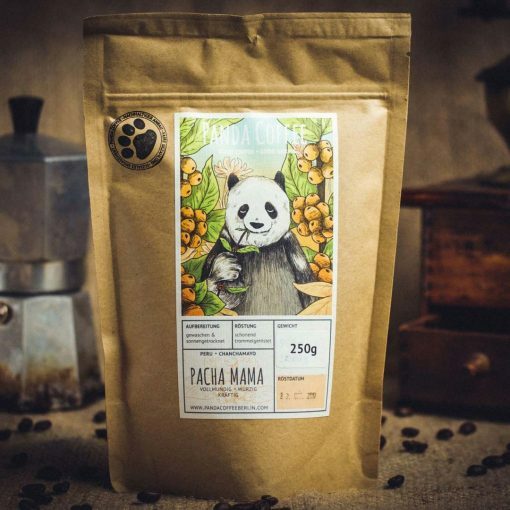 Our Pacha Mama stands out for its elegant sweetness, chocolate and almond flavor as well as its fruity note. It is balanced and has a long-lasting, silky aftertaste. Moreover, our Pacha Mama has a pleasant acidity with a fine aroma, is full-bodied, tender and spicy. 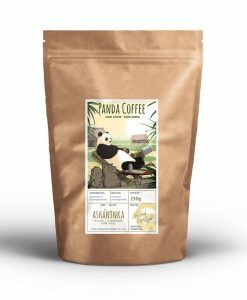 This coffee is characterized by its origin, its sustainable culture, fair trade with coffee farmers as well as respect towards the environment. Moreover, our associación also makes delicious coffee cherry tea from the cherries of the plants, which is a really efficient and resource-conserving use of the Peruvian coffee plant. The coffee has to meet highest demands – strictly according to the rules “Quality before Quantity“ and “Best Price-Quality Ratio“. We cooperate with small farmers from the Peruvian Highland, who we are constantly in touch with and visit regularly. That’s how we can best react to our customers’ desires. The price we pay to our coffee farmers is way above the world market and even fair trade price. By importing our beans directly, we ensure that farmers are paid well. The payment of each farmer is personal and direct. We also promote social and ecological projects in the Asociación, the coffee farmer association all producers around Miguel Grau belong to. The different regional projects are documented in detail. Of course, everybody can gain first-hand experience on site.